This is now a favorite for Alrik and me. A young boy "helps" his mom get the house ready while waiting impatiently for an impending snowfall. His mom gives him tasks to do that invariably make him think about snow (the sprinkling flour from baking, the cool white sheets on the bed), and he winds up making a mess each time before racing outside to check once again if the weather is cooperating with his wishes. The mother's frustrated faces are enjoyable enough as catharsis for the adult story-reader — who of us can't empathize with how much our children's help actually gives us more work to do? But I love the overall narrative of a child pitching in, however imperfectly, with the housework. The gentle relationship between mother and son, the boy's vivid imagination, and the charming watercolor illustrations are inspiring. The story culminates in a wild naptime adventure that leads into the actual snowstorm, the dad's return from work, and snug family togetherness for the night. One element I especially appreciate about this book is that it shows a family of color. It's all too common to find non-white folks in U.S. children's books relegated to the background or playing minor characters; if they are the main characters, it's often a book explicitly about race, which is fine, too — but it's nice to see a regular story with a regular family that just happens not to be white! We have the board-book version, which is a nice option for the youngest readers. The illustrations are a unique collage-based style, and the story itself is sparse and lilting, perfect to connect with little ones. I love, again, that it shows organic multiculturalism, but I also love that it's set in an urban location, with his home as an apartment building — so many children's books are grounded in suburbia and the upper middle class — and that the kids are free to roam and explore their world safely and confidently. 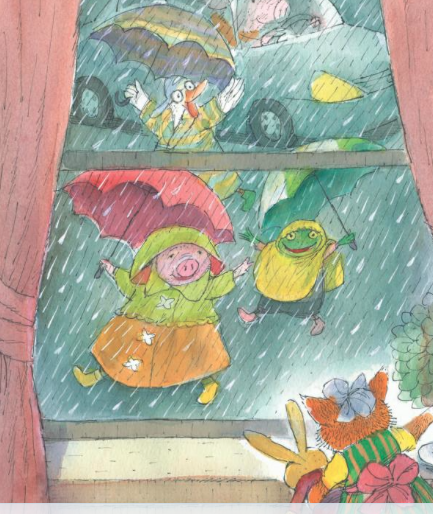 To me, it's not a book about refusing parental supervision (Peter's mother helps him into a nice warm bath at the close of day), but it is a book that shows kids need their own space and their own adventures, however small those adventures may seem. I like that at the end Peter connects with a friend and they head out together to repeat another day's enjoyment of the snow. This newer book is a delightful trip into the imagination of a young boy. (Just realized these are all young boys so far — sorry, young girls, no snow for you!) 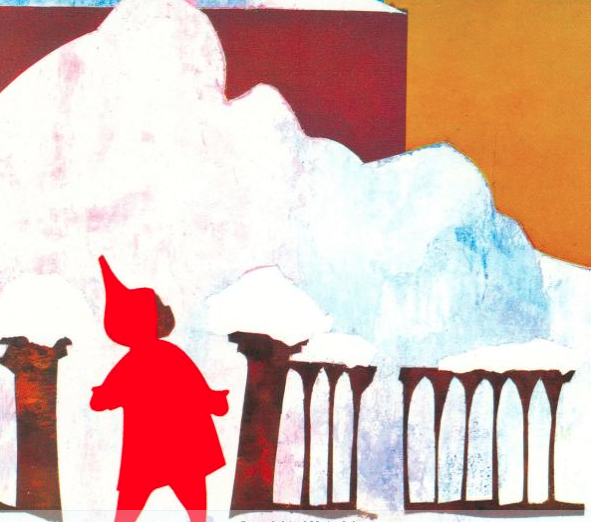 The boy's older brother doesn't want to play, so he heads out into the snowy yard on his own and soon makes new fantastical friends in giant snow-covered trees and a snow dragon he can fly on. There's not much of a story here, which makes it a good fit for children who like to take a nugget of inspiration and fill in their own imaginings. Keep in mind that this is a book that demonstrates the usual among children's books: white characters in a lovely house with a big yard. But that's ok — we can have variety. 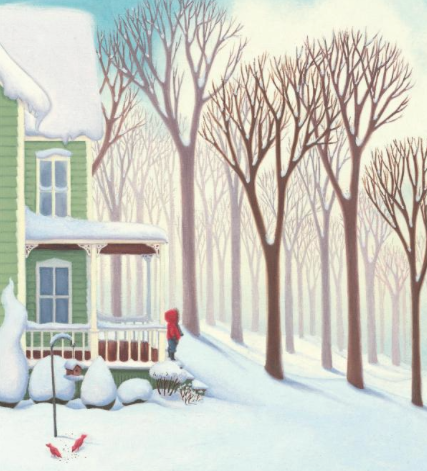 The oil-painting illustrations alone are worth admiring, with a range from captivating landscapes to sweet details and adorable expressions, and I like that at the end, both brothers emerge into the winter twilight for a last dose of snowy playtime. No snow where you are, either? 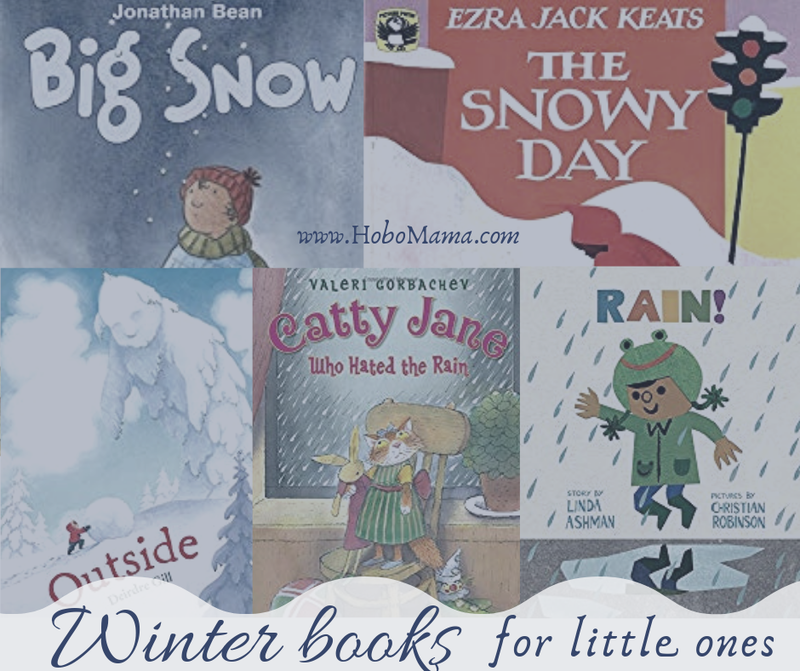 Maybe you'd like some proper Northwestern-winter rain books instead! 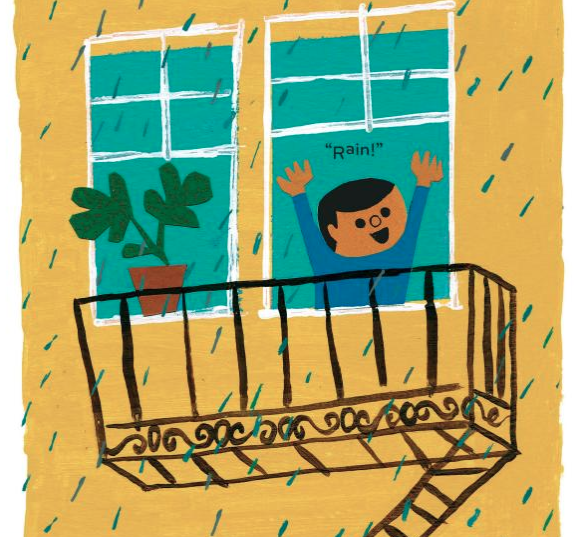 This sweet-spirited book is about a girl (hey, finally!) who really, really does not like the rain. It's not just that it spoils her plans — she has valid fears about hearing loud noises and seeing lightning and getting wet (she's a cat, after all!). Her friends all come over to her instead, and I love that they don't mock her concerns or cajole or pressure her out of them. They seek to understand them and figure out ways to reassure her and have fun anyway. For instance, they close the curtains on the lightning and play loud music together to cover the thunder. This is admirable kid-centric and kid-directed problem solving that's a joy to see. The illustrations are cute. 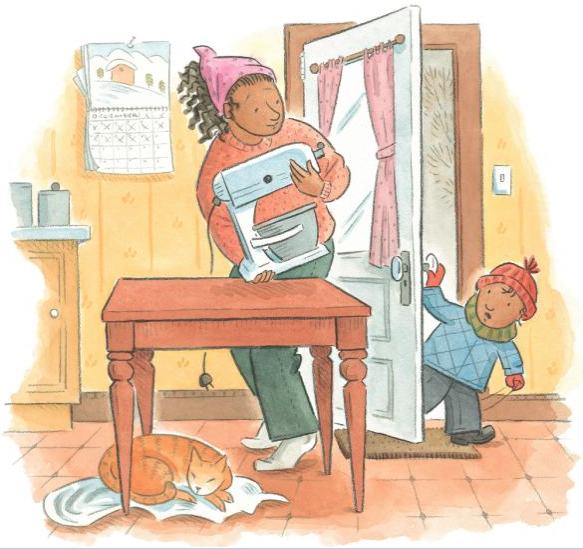 If you're familiar with the Highlights magazines, you might have seen Catty Jane and her friends before, as she's a recurring character in High Five, the magazine targeted to preschoolers. It's nice that the characters are animals, too, so that families can read into them whatever heritage they are. And, hey, different species working together in harmony is always nice! 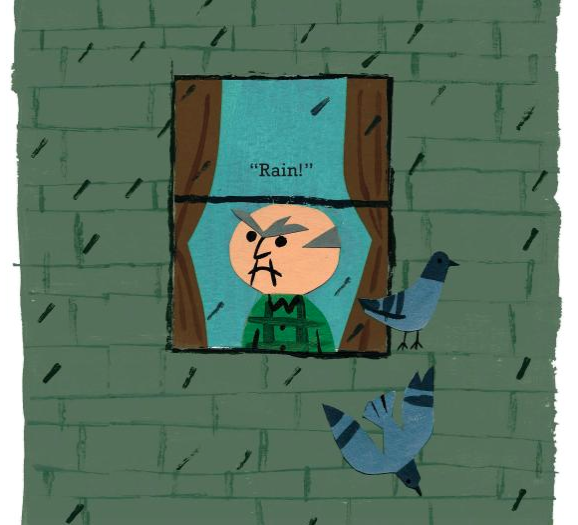 This book sweetly examines the difference attitude can make by contrasting a grumpy man's distaste of the rain with a young boy's exuberance throughout the same day in the city. The two meet up, and metaphorical thunderclouds threaten to spoil the boy's fun — but he manages to turn the mood around by helping the old grump to lighten up and even splash in a puddle on his way home. Alrik and I enjoy this one, but be warned that there isn't much text. Once you've both gotten the hang of the tale, you can do some pointing and sounds and talk to each other about what you're seeing on the page. It's written almost more like a comic book, where most of the story is in the visuals. Another hurrah for diversity of skin tones and an urban setting! And who doesn't like a kid in a frog hat? Plus, I like the message of interacting in positive ways with the strangers whose paths we cross, and realizing what influence we can have even on those in passing. 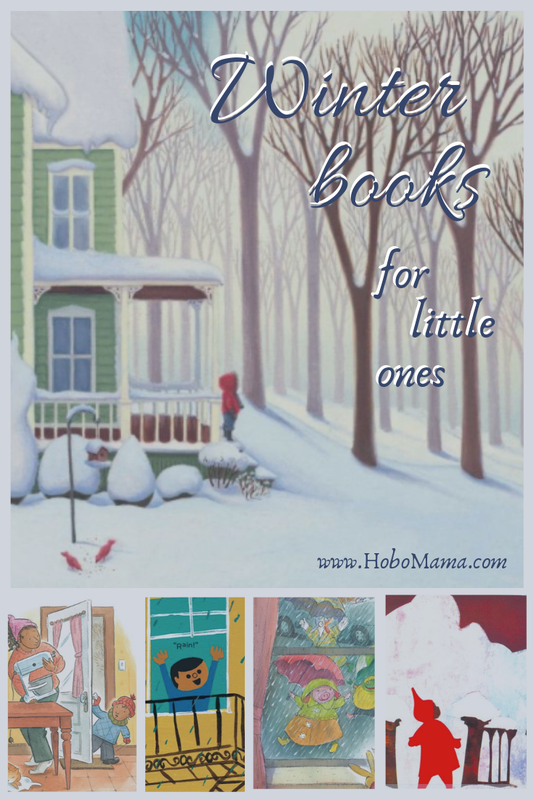 As you snuggle close this season, what wintry books do you and your kids love? Thanks for the suggestions! Putting some of these on hold at my library. :) We are always in need of new book ideas!